One of my assignments during graduate school was to assist the surly and pompous professor who briefly headed up the playwriting and dramaturgy program. He was a Boston native, out of Yale and Carnegie-Mellon, and some kind of Orson Welles scholar. His current assignment was at a Southern university but he made no effort to disguise his contempt for Southerners and the South. I found him rude and offensive but tolerably amusing and treated him with a level of respect he had not earned. One afternoon we sat in his office discussing scripts that had been submitted to the department’s playwriting program and that conversation veered off onto a number of topics. I seriously eyed him back and said, “Y’know, that may be one of the most insulting things that’s ever been said to me.” I told him I had to get to a seminar and politely excused myself, fuming. From that moment on, I detested “Welles Scholar” and was delighted to see him leave at the end of that academic year. I’m sure he meant the statement as a compliment to me but the cluelessness, arrogance, and stupidity which informed the comment made me angry and still makes me angry whenever I think about it. I had not thought of the Welles Scholar story for a number of years but it came back to me this week as I was renewing my acquaintance with the writing of Walker Percy. The great writer Walker Percy (1916-1990) is legitimately claimed by three states – Alabama, Louisiana, and Mississippi. He was born in Birmingham and lived there until he was 13. After the death of his father, his mother moved the family to Georgia. When she died, he and his brothers were taken in by a bachelor uncle in Greenville, Mississippi. He graduated from the University of North Carolina, earned a medical degree from Columbia, and contracted tuberculosis that lead to a lengthy recovery at a sanitorium in upstate New York. Percy spent the bulk of his adult years in the New Orleans area, eventually settling with his wife, Mary Bernice (“Bunt”), and children across Lake Pontchartrain in Covington, Louisiana. Percy’s writing is deeply probing and intellectual, mixing Existentialist philosophy and scientific inquiry with Roman Catholic theology and the search for spiritual fulfillment. He deals brilliantly with the South and the complexity of the Southern “character.” He writes with amused suspicion and insight about both the South and other parts of the country but the observations are always filtered through a sense of what it means to be “Southern” in all of its forms. Percy’s novels often focus on a flawed protagonist who doesn’t quite seem to belong anywhere but continues the quest for meaning and belonging nevertheless. Percy’s books are challenging and they tackle some weighty issues with an underlying wit, compassion, and turn of phrase that make them compelling and entertaining. Percy’s first published novel, The Moviegoer (1961), is still his most acclaimed. I discovered that book, and Percy, early in my college years and it is still a favorite literary discovery; I find new areas for focus with each reading. Until this week, I had not read Percy in a while. I ran across an item about him recently and decided it was time to revisit him. Since I had never read his second novel, The Last Gentleman (1966), I pulled it from my bookshelf and started to read. Here’s the odd thing: I began to run across passages that had been obviously underlined by me – they were the sorts of sentences and words that I would have underlined. The book was also full of evidence of previously dog-eared pages. I still underline passages in books and frequently dog-ear pages. I was never one to write comments in the margins, although I occasionally do that too. This is one of the reasons I will always want to deal with the object of the book; I take pleasure in the tactile physical presence as I do in the words contained therein. So I was quickly aware that I had already read The Last Gentleman at some point in time. At the beginning I thought Okay, it will start coming back to me as I read on. I read on. It all felt new to me and the last moment of the last page surprised me as if it were brand new. It was an eerie and enjoyable experience. The effect was heightened by the fact that the main character, Will Barrett (usually referred to, ironically, as “the engineer”), suffers from episodes of déjà vu and amnesia. My previously underlined passages were a form of déjà vu for me, the reader, and the fact that I had no memory of the story was my amnesia. Another odd thing is that the city in which much of the book takes place is clearly based on Birmingham (Walker Percy confirmed as much) and a frequently mentioned landmark in the book is clearly a veiled reference to George Ward’s old “Vestavia” estate on the crest of Shades Mountain that gave Birmingham’s Vestavia Hills suburb its name. (That estate, by the way, is now the location of Vestavia Hills Baptist Church for those readers who know Birmingham geography.) I am surprised that I didn’t remember any of that from my previous reading. Although I still don’t recall reading the book the first time, I’m sure that I thoroughly enjoyed it that first time just as I thoroughly enjoyed it this week. That certainty is based on the passages I underlined. Buoyed by my rediscovery of The Last Gentleman, I grabbed The Moviegoer and had the opposite experience of total recall and recognition. It was like revisiting an old friend and I remembered and enjoyed each juicy detail. The Moviegoer is a New Orleans novel and Percy makes no effort to disguise the geography or the names of the actual places. The Moviegoer is the “Ur-text” for all of Percy’s concerns and themes in his novels, essays, and philosophical writings to come. I wonder if any other writer uses the word “malaise” as often as Percy. The word peppers the text of The Moviegoer. Even so, I think Percy has an ongoing optimism tempered with realism that informs all of his writing. It is much-discussed in Percy scholarship that his early life was dogged by suicide – his grandfather and father committed suicide and he always believed that his mother’s fatal car wreck was a suicide. The novels I read this week are at least half a century old but I still share the protagonists’ sense of displacement and mistrust in a modern world transitioning to post-modern (post-future? – where are we now?) modes. The changes seem large to the ’60s protagonists – how would the world appear to and discombobulate them half a century later? The issues that occupy Percy and his characters never go away or find resolution; they just morph as the decades fall into place, one after another. How fortunate we are to have access to timeless writing that deals with these issues so searchingly, so entertainingly, and with such compassion and humor. That Welles Scholar comment about the rarity of the “intelligent Southerner” came back to me while I was reading Percy, one of the most probingly intelligent of 20th Century American writers — as well as one of the most Southern. I fantasized a face-off between “Welles Scholar” and Percy. Percy would have eaten him alive. 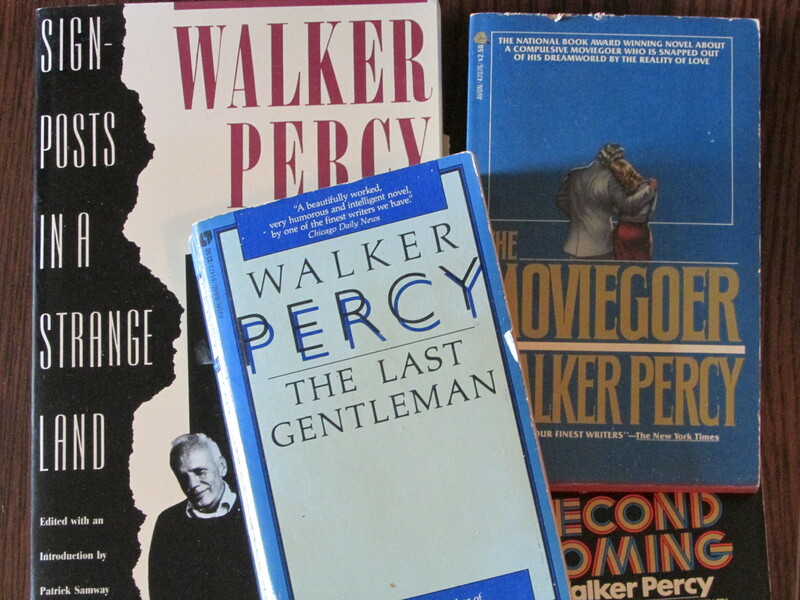 This entry was posted in Walker Percy and tagged "The Last Gentleman" by Walker Percy, "The Moviegoer" by Walker Percy, Alabama, Birmingham, Existential philosophy of Walker Percy, literature, Louisiana, Mississippi, New Orleans novels, Southern literature, the south, Vestavia in Birmingham on June 5, 2015 by gedwardjourney.